You are here: Home / Skincare / Alternative / Acupuncture Facial: The New Facelift? Acupuncture Facial: The New Facelift? Is an acupuncture facial the new facelift? In facial rejuvenation acupuncture another form of cosmetic acupuncture the goal of an acupuncture facial is to eliminate wrinkles and muscle tension that may be causing facial lines. 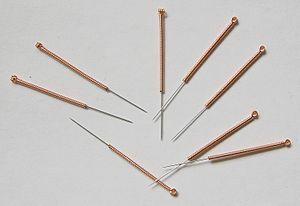 Needles are put into acupuncture points that stimulates the body’s natural energies, called Qi. Qi is an active principle forming part of any living thing. Qi is translated as being life energy, energy flow or life force. Qi is the central underlying principle in traditional Chinese medicine. What does it feel like? How does it lift the facial muscles and soften wrinkles? There can be a faint pinching or pricking feeling when needles are inserted into certain areas of the face but the feeling quickly goes away. You are usually left feeling a slight warmth or tingly sensation rolling on the face. There is no definitive research on the benefits of facial acupuncture. However that feeling could be the result of an increase in Qi (energy) and Xue (blood) to the area. The needles are supposed to be causing “micro-irritation” under the skin, which helps to reduce wrinkles. While reducing muscle tension and causing the facial muscles to tighten making the face look firmer and helping to ease certain facial contractions. A needle penetrating the dermis creates damage making the body respond by producing collagen. How much does it cost? How Many treatments will I need? What it can not do? The result is subtle with about 30% of the result you would see from a conventional face lift. It does not stop the movement of the facial muscles that creates lines like Botox can. Nor can it tighten or even out the skin as surgery or injectable fillers (such as Restylane) can. You will need a series of 10 to 16 sessions; this not a one visit treatment; (every week or twice a week) with monthly follow-up sessions for maintenance. Each session costs approximately $125-$200. When choosing an acupuncturist for facial rejuvenation look for someone who not only has training in this area, but who has graduated with a master’s degree from an accredited Oriental medicine school and passed the national board examinations. The National Certification Commission of Acupuncture and Oriental Medicine is a good place to start and also check to make sure is he or she is licensed in your state. This not for everyone although acupuncture has been used to help people with migraines, seizure disorders, or high blood pressure, for example, they are probably not good candidates for cosmetic acupuncture. If you are thinking about having this procedure done ask for a consultation first to make sure that you can have the treatment. Acupuncture facials are a good choice for people who do not want more drastic procedures. Wrinkles are a by-product of the aging process. As we age, the cells of the skin divide slower and slower, and the dermis of the skin, begins to thin. The network of elastin (the elastic protein found in connective tissue which causes skin to stretch) and collagen fibers (proteins in the skin, which support the skins structure), loosen and unravel. Which then causes depressions on the skin’s surface. With aging, skin also loses its elasticity making it harder to retain moisture. Oil-secreting glands become less productive and the skin heals at a slower rate. All of these factors contribute to the creation of wrinkles. « Essential Oil of the Month: Melissa! up half of your budget before you even blink. If you have you ought to really just simply following that link.